When he came out of jail Hani decided to switch from rocks to a video camera. He gathered friends around him and they documented abuses. He became a nonviolent resister. He posted the abuses on YouTube. 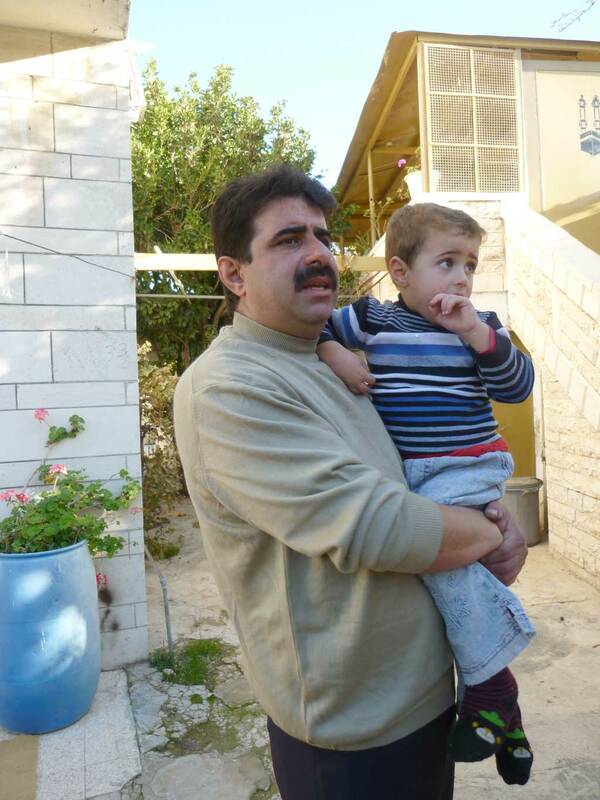 He opened his spacious home to guests who were analyzing the problems in the West Bank. Settlers would come in to an area. Sometimes they would come up to a area of Hebron and say, “Jesse was buried here,” or “Ruth gleaned wheat in this field.” They might have a picnic there one day. The next day they may start to worship there. So these ultra-religious Jews put up a large canvas tent. Soon a family or 3 or 4 move in to stay. Hani says, “the settlers are not neighbors, they are visitors.” They believe that the Lord promised them this land. God’s law takes precedent over human laws. Many of Hebron’s settlers come from Brooklyn, NY and are considered extremist by other Jews. Once his young daughter was attacked by a settler child. Hani turned to Peacemaker Teams for help. Thus began the school accompaniment program for CPT. Hani continues to promote nonviolent techniques among Hebron activists. He works with the Hebron Defense Committee and a group called “One World for Justice.” Hani, with others, are suing the Israeli military for war crimes. Meanwhile Hani takes us past 4 checkpoints. We sit in his house while his 3 year old, Said, bounces a big rubber ball. He is fighting to keep his land. Settlers have moved adjacent to his property, illegally but with government support. They throw refuse on Hani’s porch. There are bullets holes scattered on a wall in his garden, from an attack on his home in 2000. The bullets barely missed him. The family olive orchard sits on a hillside near his home. For many years the orchard has stood right up against the separation wall, tree trunks twisting right and left as if adjusting to our human foibles. Twenty years ago Hani’s family harvested from hundreds of these trees, old like the sequoia. During the Second Intifada about 250 were chopped down, the axe destroying along with the rifles. We walked along the gravel road, hiking up steep stone steps. Hani points out parts of the wall that come from King Herod’s time. I feel the freshness of a deep well at the bottom of a vertical cave, some believe to be Abraham’s well. The scarce water, the clear sky, the old olive trees, all hold a secret power. It’s a power that goes beyond the frisking, beyond the rifles, beyond the naming of the Holy of Holies. This is Canaan, a land of promise. The richness is beyond belief. I love it here. I don’t understand the division among the groups. I understand military. I understand guerrilla warfare. Peace groups ask us not to look at what Israel, or USA or even the UN says about the West Bank, but instead to look at what they do. What are the facts on the ground? Israel encourages settlers; Palestinian land is grabbed by Israel and all the world knows it. Peacemakers like Hani speak truth. But peace groups aren’t talking to settlers, those who have changed the map of Israel and Palestine. If settlers are responsible, who is dialoguing with them? How can we hold the Israeli leaders, Hamas leaders, USA and EU leaders responsible? So many of us feel a love of this fertile crescent. God’s blessing is here for everyone. Hani Abu Hikal is working hard for peace. Many Jews are committed to justice in Israel. I ask you, what can we do? minga and jvb, this is one of your best. by profiling human begins you reach for the universal. as you and others have commented, how to engage with the settlers? especially in hebron which as you know seems to draw the most extreme settlers, often from the usa. i suspect one way to foster engagement is to not identify as cpt. rather visit one of the museums or shrines israels have constructed in hebron to portray their views. be a tourist, curious about their views. such as hadassah. have you been there? as i recall, it is one of the first settler installations. also, maybe you realize, hani may be part of a larger video campaign organized by b’tselem. Keep it coming. Am appreciating immensely your posts…thank you for keeping us connected. Thank you so much for sharing this story- and I agree with you- who is engaging the settlers, those on the ground making the land grab- for whatever reasons- I was horrified they were so disrespectful- throwing garbage onto his porch- and making problem for a girl child going to school- can people take a stand and form a blockade- I guess that would not be engaging them in dialogue- can a group approach a settler one settler family at a time with a small group of peacemaker/witnesses- and just begin? Hello Minga and Johnathan – Thanks so much for your good work and your postings. What an incredibly difficult situation. I love the way that you have spotlighted the violence issue with the story of Hani. I also love the phrase that you wrote – ” For many years the orchard has stood right up against the separation wall, tree trunks twisting right and left as if adjusting to our human foibles.” What foibles we exhibit – to think that the land can actually belong to anyone – we belong to her. Much love to you both – thank you for your peacework and your love!